A brilliant comedic fantasy story, where the characters are actual actors and comedians that play themselves, in a scenario where Armageddon occurs while at James Franco’s house warming party. I had no idea what this movie was about when I started watching. It was fairly new, had some currently well known actors, and I was in the mood for a surprise. So I was very pleasantly surprised. For such an off-beat story line, this movie is incredibly well written and thought out. To enjoy this film you have to be able to appreciate comedy and fantasy. And having a sense of what Armageddon is will definitely help as well. We have the same old Sci-Fi “end of the world” rich people against poor plot. The only difference about Elysium would be the particular brand of tech and space station involved in the story. There is really little change in theme from Matt Damon’s Bourne movie series. It’s fairly well told, entertaining action, and special effects are excellent. It was fun to see Jody Foster as the villain, but they could have done a lot more to build her character. And in the end it felt like her character just gave up, and we have to guess why, cause it was completely out of character. The movie would have been a lot better with her character having more air time, substance, and end fight. The ending wraps everything up in a pretty little cute unrealistic bow. Which I could have done without. Sure have the good guys win, but maybe without the completely expected perfect ending. They obviously knew this was a one win pony and had no hope for a sequel. The ending in Sci-Fi doesn’t seem to matter that much these days, it’s all about the punch you can throw into a really good trailer. It’s a reasonably good movie with an infantile ending. This isn’t your traditional zombie movie, but it is a typical zombie movie. The only differences this round are that the zombies are very fast and strong, and act like rabid lemmings. There is good character and plot building. And the story is mostly action, and is well done. Other than that it’s the same old zombie, end of the world thing. The movie holds your attention, and is rather intense. And for that, I give it a good rating. 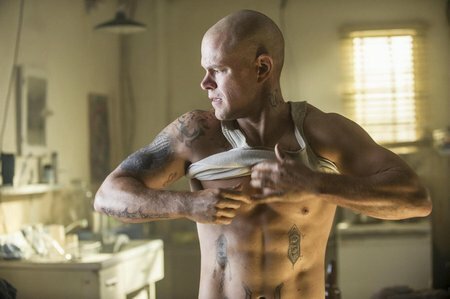 I would like to see a zombie movie that tried to use science to explain how a virus could make a human into a super human that can live forever without eating. Even vampire fantasy movies point out how a vampire has to keep drinking blood (fuel) to stay “alive”. But every single zombie movie I’ve seen shows that zombies live forever and simply live off air, and only eat for “fun” and to infect. I think the zombie concept is one of the lamest in the fantasy movie realm. I’m fine with the concept of a virus turning humans into mindless rabid animals, but the infinite life spans, and partial bodies, makes it complete fantasy. Where are the science fiction zombie movies? I felt World War Z tried to legitimize the zombie movie as science fiction, but it doesn’t come close. Nothing lives forever, and all plaques die out, and all “real” zombies would eventually die, assuming they were eating something and at least dying of old age. I didn’t like that when this movie came out, the trailers told you absolutely nothing. I felt they were trying to hide a bad movie behind deception and mystery, which lead me to believe it was going to be a crappy movie. I think I was probably half right. I think they were worried it would be perceived as just another “same old” zombie warm over, and it is. It has a slightly new twist, and is well made and told. And for that it’s a decent flick. But because of the annoying and intentionally vague ads, I had less than no interest in seeing it in a theatre. Good job marketing department! I wanted to listen to music and podcasts in the car from my smart phone. My car unfortunately didn’t have the required A2DP Bluetooth capability, only the standard hands-free phone Bluetooth connection. The car did however have a 1/8″ line-in jack. A cable is always less convenient, but does provide the best possible audio connection of course. The other issue that can occur in some cars with some smart phones is ground loop hum, hiss and whistle when a power cord and line-in cable are both plugged in at the same time to a car audio device. Sometimes a ground loop isolator will solve the problem, and sometimes it will not. Either way, you still have an audio cable to plug into your phone. My first attempt at using a Bluetooth media connection to my line-in port, was with a Belkin F8Z492TTP Bluetooth Music Receiver. Easy to set up, and very small. It’s powered by 5 volts DC, but does not come with a 12 volt car adapter, or a USB cable. So I had to fashion my own custom USB to tiny round jack cable, to power this item in my car. But the audio quality results of the Belkin were poor. General audio quality was poor, and worst of all, vocals had very noticeable and annoying echo. Music sounds okay, not great, and the echo wasn’t obvious with music. But vocal podcasts sounded like the speakers were in a barrel. I next tried the Rocketfish Bluetooth Music Receiver (RF-BTR212). I had the same issues with powering the device, no included 12 volt adapters or USB cables. Just like the Belkin, it used a two wire round plug. It also was powered by 5 volt DC, so why these companies don’t use a standard micro or mini USB plug for power it is strange and annoying in this day and age. So I fashioned another custom USB to round plug adapter cable to power it. Most of us are used to using 12 volt adapters with USB ports in our cars these days. And some have 2 USB ports, which is ideal to charge a phone and then power a second device like a Bluetooth media receiver. The audio quality of the Rocketfish is night and day from the Belkin! Far superior audio quality, excellent music clarity, and no echo on vocals in podcasts. The device is about 4 times the size of the Belkin, but still reasonably small. If using it indoors with a stereo, it also has an optical out connection, which is a nice option. 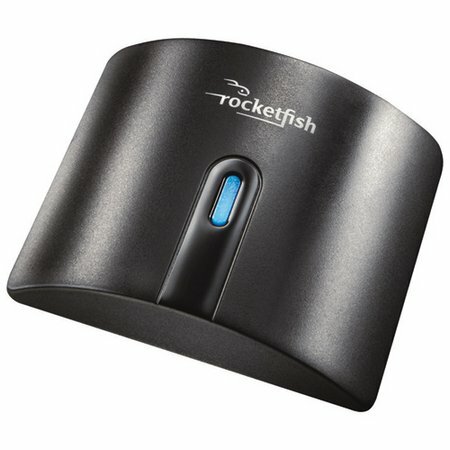 Reviews often mention that the Rocketfish does not have the range that is claimed. It claimed to have a radio distance of 33 feet. Many other reviewers say they only get 6 to 8 feet. In my case I only need 2 to 3 feet. So I’m good. I didn’t test the range of mine. I would definitely recommend this item for streaming audio from a portable unit like a smart phone, indoors or like me in the car.